I have been waylaid by my exhibit schedule I will get back in touch with her though! Thanks so much for the comments! I love your new hair! I didn't even recognize you. Looks like a great show! Love the new hair! Is all that art yours behind you? I love every single one! It is all mine, Maria thank you so much! I can ship to Canada! Great photo and spunky new doo! 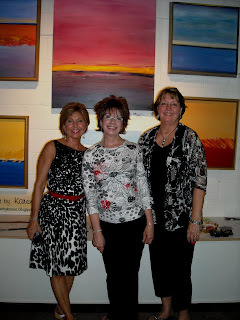 The paintings are incredible beautiful so as the girls on the photo… I really appreciate you for posting a link to the art website. Thank you. That’s a very artful and fun exhibit. The paintings at the background of this photo really are eye catching. I had my eye on red one. thanks for sharing this. Thanks to all for your comments. I love to share my art experiences. It is so gratifying to see what people love in my art! Karena, you faithful commenter on my blog! I love you! You are all beautiful. Nice outfits!!! I didn't even recognize you! welcome to the 'red hair'world! it looks fantastic on you!